Burd is a Nord knight and Captain of the Bruma Guard. He works in a close partnership with Yvara Channitte, the castle steward. She understands the south, while he understands the north. Burd will accompany you into the Oblivion Gate during the Bruma Gate quest and is also involved in several other quests in Bruma. At the start of the game, he is an essential NPC. However, at the start of the Defense of Bruma quest, he becomes non-essential. Burd spends all of his time within Bruma Castle. He starts his day when he wakes up at 6am. From this point up until noon, he will roam around the Castle. He will visit the Lords Manor, a Guard in the Great Hall and the Jailer in no particular order. At midnight he will return to the Guard Barracks where he will pace around up until his bedtime at 2am. Burd wears a standard Bruma cuirass, along with chainmail greaves and boots to cover up the rest of him, excluding a helmet and shield. When he is asleep or eating he slips into a set of upper-class clothing, a green brocade doublet with a silk garment and sometimes even a pair of green velvet shoes. He carries three healing potions and a key to the castle. For defense, he has a steel claymore. Burd also has a decent spell selection. For starters, he possesses the Blood of the North Birthsign ability which grants him the Restore Health lesser power. Additionally, Burd can cast a leveled selection of major Illusion spells, due to him being a Knight. When you approach him for the first time, he will introduce himself: "I'm Captain Burd, commander of the Bruma Guard." 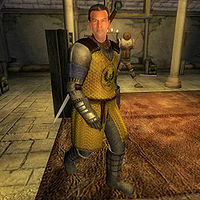 When asked about Bruma, he will assure you that he is keeping an eye on his guards: "I make sure my guards treat the local Nords and their ways with respect." Although Burd is a guard, he will never arrest you. All of the dialogue lines used by guards when arresting are specifically for Imperial guards, but Burd is a Nord. Burd's body is tagged as a quest item, meaning it will never disappear from its resting place should he be killed. This page was last modified on 11 November 2018, at 19:46.